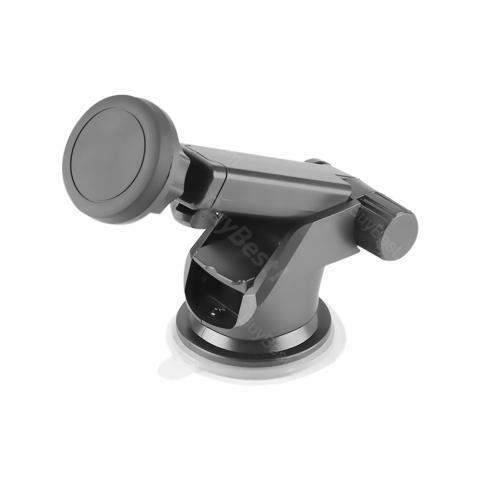 With soft sucker and powerful magnetic force, Long Arm Car Phone Holder can be installed on different surfaces firmly, including automotive dashboard. Long arm is helpful for saving space and adjusting angle at will to ensure no obstacle of driver’s sight. With soft sucker and powerful magnetic force, Long Arm Car Phone Holder can be installed on different surfaces firmly, including automotive dashboard. Long arm is helpful for saving space and adjusting angle at will to ensure no obstacle of driver’s sight. What's more, good skid-resistance and shakeproof avoid falling to guarantee safety further. We believe you will like it. Super easy to mount, and it hold fast and secure. It's so much better than those that enclose the whole phone, falls apart during driving and rattles from time to time. My friend saw me attach this to my dashboard and when I showed her how easy it is to secure it (1 second by the way), she said she's getting two. One for her and her husband. So glad I found this and don't hesitate to get it because you can swerve the neck to suit your needs as well. Update: I've upped my rating since last from 3-5 stars, here's why. I decided to try it out without the case (one layer plastic, one layer rubber). Without the otterbox case, it's really strong. It holds up and the metal in my phone is enough to hold it without attaching the metal backing. Their customer service dept. got in contact with me after the review, and they made it right by me. I didn't need to send the product back and they still did it right. Their customer service dept. is awesome and their products are as well. its amazing its ork very well I loved it. Perfect little dash buddy to hold my phone and keep my dash from looking ugly. I love how well this sticks and the strength of the magnet is incredible. It's positionable to keep my phone (iPhone 8) secure in either portrait or landscape position. I love this and will likely get one for the other car as well.